We were deeply honored by the invitation and touched to know that the two women came up from Washington especially for this meeting. Over tea we had a wide-ranging conversation that touched on many topics: my experiences living as a monk in Sri Lanka, the monastic practice of alms round, the origins of Buddhist Global Relief, the values that inspire and sustain us, the effectiveness of school meals for poor children, simple methods of curtailing food waste (namely, plastic silos for storing grain), and the need for the international community to collaborate in combating global hunger. I also invited them to visit Chuang Yen Monastery, where I live, on their next visit to New York. It was an absolute pleasure meeting you in person yesterday. 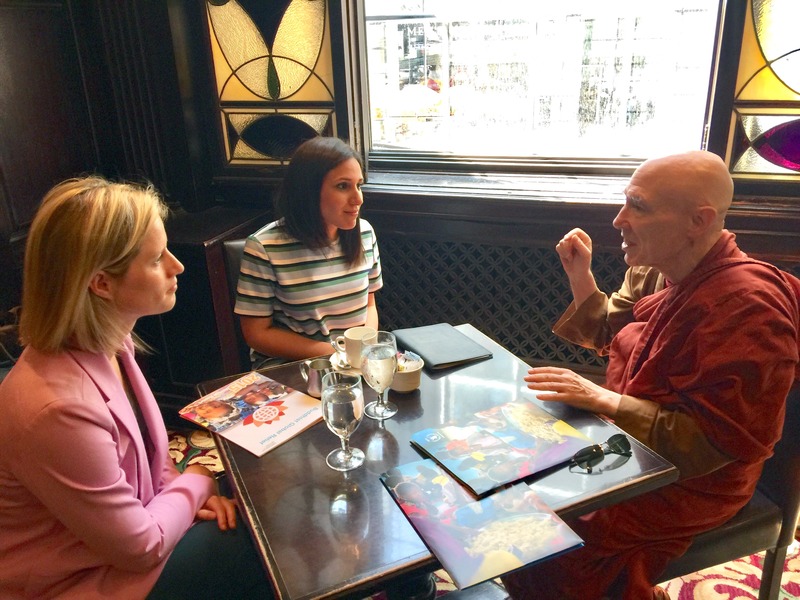 Thank you for sharing with Erin and me your commitment to making the world a better place as well as some of your values – “kindness, love, life, beauty, health and happiness.” The meeting was truly inspirational. This entry was posted in Engaged Buddhism, Global Hunger, News item and tagged Bhikkhu Bodhi, Children's hunger, Engaged Buddhism, Global hunger, world food programme. Bookmark the permalink. What a beautiful story to share! Despite my own financial struggles after losing my job, I donated money to UNICEF just yesterday, realizing that those children are in desperate need of fundamentals such as food, shelter and medicine. All of it I still have plenty and nothing can compare to the devastating humanitarian crisis in some parts of the world. Thank you for BGR of playing an important role by making a difference, in giving and raising awareness.